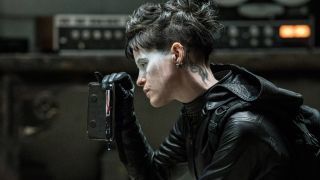 Following in the footsteps of Noomi Rapace and Rooney Mara, The Crown’s Claire Foy is the latest person to play the punky badass hacker Lisbeth Salander on film. Rapace starred in the Swedish-language Millennium trilogy, before Mara landed an Oscar nomination for David Fincher’s English-language remake of The Girl with the Dragon Tattoo. Now Foy has inherited the role, in a film that’s more reboot than sequel, based on an adaptation of the book of the same name (the first to be written by David Lagercrantz, who continued the book series after the death of creator Stieg Larsson). Directed by Fede Alvarez (Evil Dead, Don’t Breathe), the film looks set to amp up Lisbeth’s avenging angel qualities as she goes about exacting spectacular revenge on very bad men. The Girl in the Spider's Web opens in the US on November 9 and the UK on November 25, and you can read much more about it in the new issue of Total Film magazine which is on sale now. Inside you’ll also find the latest on Fantastic Beasts: The Crimes of Grindelwald and Bumblebee, as well as in-depth features and interviews for First Man, Halloween, Overlord, and much more. And if you’re a fan of the mag, why not subscribe so that you never miss an issue? If you sign up, My Favourite Magazines will deliver every new issue through your letterbox before it hits shelves (with an exclusive subscriber-only cover like the one seen below), and you’ll save money on the cover price. What’s not to like?